Geoff Campbell was one of the 67 Britons killed in the 9/11 attacks. Mat says: "In at least one documentary, the BBC removed the sounds of huge explosions going off in WTC7 moments before its collapse." 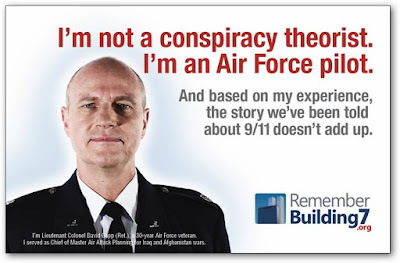 In 2016, a survey in the US magazine Live Science revealed that most Americans (53%) believe the U.S. Government is hiding information about the 9/11 attacks. The third tower at the World Trade Centre was not hit by a plane, and yet it collapsed in seven seconds. In September 2017, a team of engineers at the University of Alaska concluded, after two years of forensic research, that fire could not have caused the collapse of the third tower, World Trade Centre building 7. 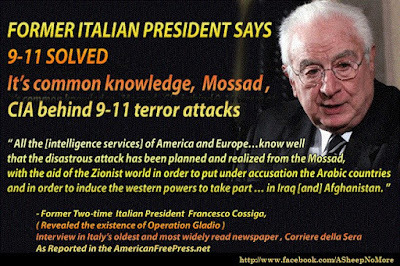 Matt, and others, believe that 9 11 may have been a copy of Operation Northwoods, the Pentagon plan to carry out false flag attacks in the USA. Matt notes that none of the 'hijacked' planes was intercepted by fighter jets. Matt notes that in the days immediately prior to 9 11 there was an extremely high volume of bets on the price of certain shares falling - shares that included those of American and United Airlines. The Twin Towers could not have been brought down by hot aircraft fuel. Steel does not begin to melt until it reaches around 2,800f. Jet fuel cannot burn hotter than 1,700f. The Mohammed Atta who was trained by the US military was working for Mossad. The CIA and its friends must have used explosives to bring down the towers. Firefighters, on 9 11, did hear explosions. For example, firefighter Richard Banaciski said: "There was just an explosion. It seemed like on television when they blow up these buildings. It seemed like it was going all the way round like a belt . . . all those explosions." Firefighter Kenneth Rogers said: "There was an explosion in the South Tower. Floor after floor after floor. One floor under another after another . . . I figured it was a bomb because it looked like a synchronised kind of thing. Fire Captain Dennis Tardio said: "I hear an explosion and I look up. It is as if the building is being imploded from the top floor down, boom, boom, boom. I stand in amazement. I can't believe what I am seeing. The building is coming down." In the case of the third tower, WTC7, bystanders, interviewed by US television, said there were "bang, bang, bang" sounds before it fell down. 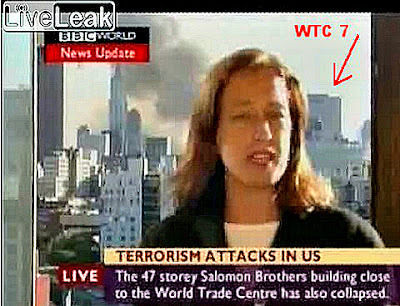 Above, we see the BBC's Jane Standley, who is standing in front of the clearly visible WTC7 tower. Jane Standley says of WTC7: "The 47-storey building, situated very close to the World Trade Centre, has also just collapsed. It seems that this was not the result of a new attack. It was because the building had been weakened during the morning attacks." In many parts of the world, the key people in key institutions work for the CIA and its friends. 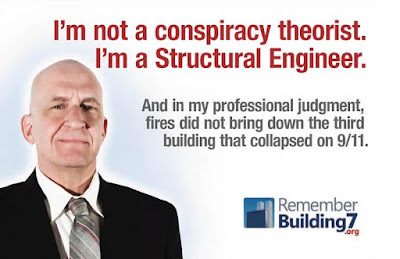 Several journalists working for the CIA and its friends reported that WTC7 had collapsed 23 minutes before it had actually fallen down. 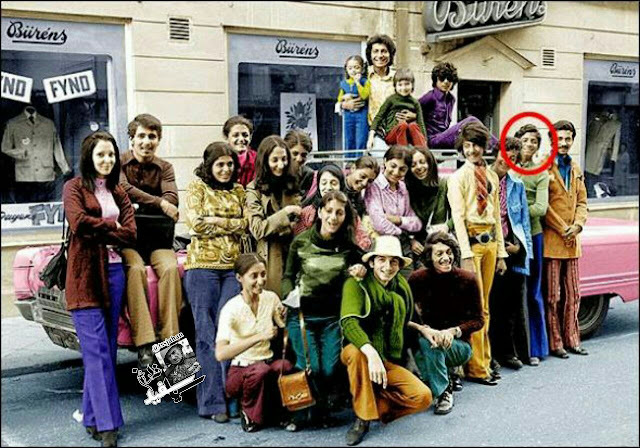 Osama bin Laden, of the Crypto-Jewish bin Laden family. According to the newspaper Scotland on Sunday, Osma bin Laden worked for the Jewish mafia. 9 11 has been REVEALED by The Daily Mail. And the most startling question, which remains unresolved, they say, is why the hijackers’ principal target, the two 110-storey towers at the World Trade Centre in New York crumbled so easily. No-one who watched each building suddenly cascade into dust and debris in just 20 seconds will ever forget the slow-motion horror. It had not been hit by a plane yet it, too, mysteriously fell many hours after the Towers had gone. The official explanation for this was that fuel stores caught fire as a result of debris from the burning towers, the building began to bulge in one corner, and after that it was unsalvageable. All the while the local TV channels were smoothly getting eye-in-the-sky helicopters into the air over the World Trade Centre. In the words of the authors: “Their routine mobilizations stand in stark contrast to the apparent impotence and indecisiveness of the $350-billion-a-year US military. Yet for all the shortcomings of the Federal Aviation Authority and the US Air Force that day, no-one was ever fired or reprimanded. ‘LIHOP’ – ‘Let It Happen On Purpose’ – holds that since the turn of the new century, radical right-wingers in Washington (the so-called neo-cons) had been keen to get a US military presence in the Middle East oilfields and were also desperate to do something about Al Qaeda, which had been targeting US interests overseas. When evidence came in of an impending terrorist attack, they decided to ignore it. They intended that it should succeed. It would act at the very least as a ‘wake-up’ call to their apathetic fellow countrymen and at best as an excuse for war. In the much the same way, some historians believe, President Roosevelt knew in advance from broken codes about the Japanese attack on Pearl Harbour in 1941 – but let it happen, at the cost of 2,400 lives, because he wanted an excuse to join World War II.